Saint Patrick, the patron saint of Ireland, is credited with bringing Christianity to Ireland. He was born in Wales somewhere around AD 385. He was carried off by pirates and spent six years in slavery before escaping and training as a missionary. The national emblem of Ireland is the Shamrock (a green plant). Patrick used the three-leaved shamrock to explain how the Trinity of the Father, Son and Holy Spirit could exist as separate parts of the same being. His followers took to wearing a shamrock in celebration. 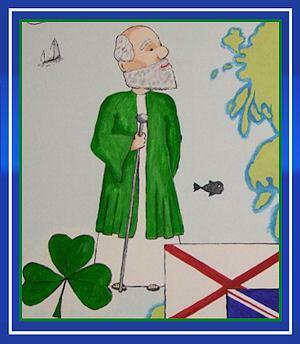 The most famous story about Saint Patrick is him driving the snakes from Ireland. St. Patrick's Day is celebrated on 17 March.